I had a problem annoyed me for about two years tat when generating reports in TMG, they were always completed with empty data and graphs and after trying to solve the problem by searching in internet I found (by chance) that reports will only work if logging in TMG is configured to log to SQL database not text log files. It was strange and annoying for me as that was not the case when I used ISA 2004 & 2006 before. 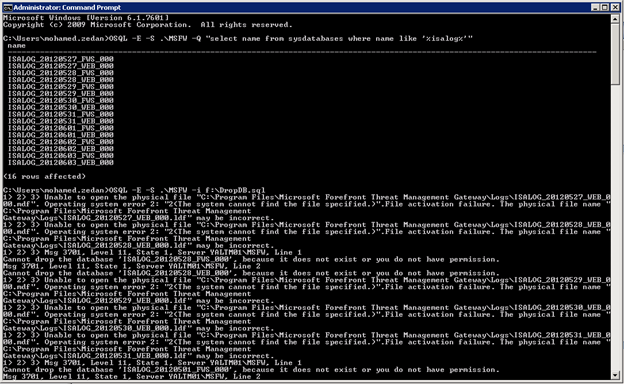 I always configured ISA logging to text log files so I can use them with other log analysis tools. I found that there are number of databases registered over a year ago, but they are physically not on my server. As you see in the result of the command, the system cannot find the database files associated with registered database, as explained in the error: “<The system cannot find the file specified.>”. 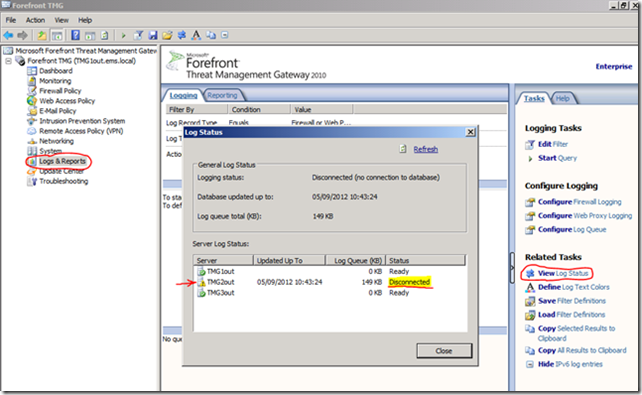 4) Restarted the “Microsoft Forefront TMG Firewall” service and then check back the Log Status. Then clicked refresh a few times till current status no longer as “Disconnected” but as “Queue in use”. In my next post I will explain a VB script I wrote to import entries from summary logging database and export them to a single SQL database to analyse them.